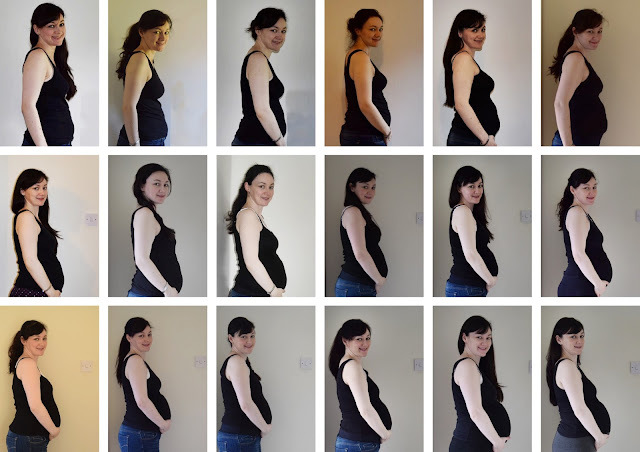 37 weeks – how on earth did that happen? As I type this I’ve a few days left at work and I really cannot believe the end is in sight. In many ways this pregnancy has flown by but at the same time it has dragged too. Up until last Friday we were both under the impression that bubs was breech but at my 36w midwife check on that day we discovered he is finally head down. It was a relief to hear as for this whole pregnancy he has been transverse then breech so we were losing hope that he would turn. It’s great to know I can now experience labour and a natural delivery but in a way I feel quite odd about it too. For the past few weeks both of us have mentally been preparing ourselves for the more than likely event of a c-section and now we are having to get used to the fact that we will get that natural delivery. It’s not even that I wanted a section, the thought of surgery freaked me out but I had made peace with myself that there was such a high chance of it taking place and the end goal was him being born safely. Now everything has quite literally been turned on its head (excuse the pun) and I’m having to prepare myself for labour and what I want from the birth. Do I go for water? What pain relief will I have? Do I try an active birth? I’m feeling a bit overwhelmed by the options. The big bonus is knowing I can have skin to skin straight away which I’m hoping will make establishing breastfeeding a lot easier. I know recovery will be quicker too. I guess my main issue is getting myself in the right headspace for it and trusting my body to do what nature intended instead of relying on surgeons. I'm definitely done with pregnancy now. I feel so lucky and so fortunate to have had a fairly easy time of it (bar the tiredness and backache) and I know so many women would swap with me in a heartbeat but part of me feels like I've been pregnant forever (we found out on the 23rd June). I just want to finish work and meet this little man we have been growing and preparing for over the past 9 months. Pregnancy is a strange thing, it messes with your emotions in so many ways. I'm trying to savour these last days and weeks as this could be my one and only pregnancy. Ideally I would like 2 or 3 children but we just don't know what the future holds. I want to enjoy it yet I'm fed up with it too and can't wait to start our new life as a family of 3. I've been getting Braxton Hicks these past few days and I keep wondering is it time although I really don't want my waters to break at work - could you imagine?? One thing I have loved and I'm so glad I made the effort to do was to take bump shots most weekends. It's amazing to see how my body has grown from a little podge to a huge bump! Sorry for such a rambling post but this is inside my head these days - a crazy jumble of thoughts and emotions. How did you feel in your final few weeks of pregnancy? Amazing to see how my body has changed over these 9 months!